Always neat, always clean and always well attended, Laundry Mart is the cleanest and nicest laundromat in the Puget Sound area offering self-service and drop-off laundry services to both residential and commercial customers. We are not your typical laundromat! Our stores are clean. Really clean! We feature only state-of-the-art, environmentally conscious commercial grade washers and dryers. Our stores have Dexter front-loading washers with fast extraction spin in five sizes from 18 to 80 lbs., and high efficiency dryers, 30 to 80 lbs., so you never have to wait to finish your laundry. Completely coinless, all of our machines are computer operated and are activated using the Easy Card system. We also offer a customer loyalty program where customers who use the same reloadable card on return visits can earn bonus awards toward free dryer starts! 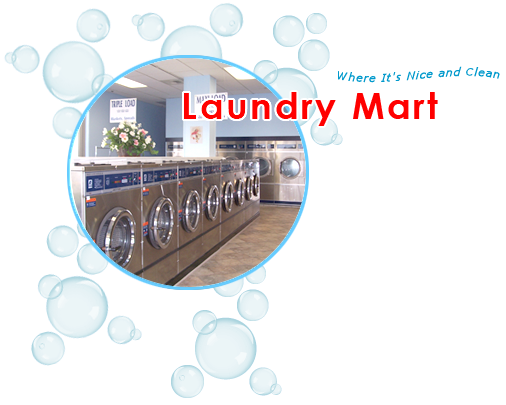 Laundry Mart is dedicated to meeting the laundry needs of all our customers. With a great atmosphere and friendly attendants, we are always available to help you with your laundry needs. We put great effort into excellent customer service, quality machines, competitive pricing and rapid turnaround times. It is like no other laundromat you've been in. Copyright © 2010 Laundry Mart. All Rights Reserved.